STV has also been used in several other jurisdictions, particularly in provincial elections in the cities of Edmonton and Calgary in Alberta (until 1959, when the Alberta provincial government changed it to first past the post). Less well known is STV use at the municipal level in western Canada – Calgary used STV for more than 50 years before it was changed to first past the post. For a more complete list, see History and use of the single transferable vote. When STV is used for single-winner elections, it is equivalent to the instant-runoff voting (alternative vote) method. STV used for multi-winner elections is sometimes called "proportional representation through the single transferable vote", or PR-STV. "STV" usually refers to the multi-winner version, as it does in this article. 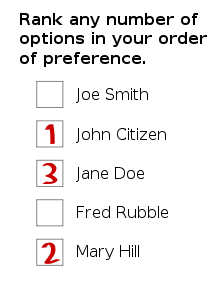 In the United States, it is sometimes called choice voting, preferential voting or preference voting ("preferential voting" can also refer to a broader category, ranked voting systems). Hare-Clark is the name given to PR-STV elections in Tasmania and the Australian Capital Territory. Simplified example of an STV ballot. In STV, each voter ranks the list of candidates in order of preference, marking a '1' beside their most preferred candidate, a '2' beside their second most preferred, and so on as shown in the sample ballot on the right. As noted, this is a simplified example. In practice, the ballot would usually be organized in columns so that voters are informed of each candidate's party affiliations or whether they are standing as independents. The most straightforward way to count a ranked ballot vote is simply to sequentially identify the candidate with the least support, eliminate that candidate, and transfer those votes to the next-named candidate on each ballot. This process is repeated until there are only as many candidates left as seats available. This method was used for a period of time in several local elections in South Australia. In effect, it is identical to instant-runoff voting, which is commonly used in leadership contests, except that the transfer process is terminated when there are still several candidates remaining, if all the seats have been filled. However, preferences for elected candidates are not transferred at any value, possibly penalising those who vote for a popular candidate. The Droop quota is an extension of requiring a 50% + 1 majority in single-winner elections. For example, at most 3 people can have 25% + 1 in 3-winner elections, 9 can have 10% + 1 in 9-winner elections, and so on. If fractional votes can be submitted, then the Droop quota may be modified so that the fraction is not rounded down. Major Frank Britton, of the Election Ballot Services at the Electoral Reform Society, observed that the final plus one of the Droop quota is never needed. So, the quota for one seat is fifty out of a hundred votes, not fifty-one. A candidate who has reached or exceeded the quota is declared elected. If any such elected candidate has more votes than the quota, the excess votes are transferred to other candidates based on their next indicated choice. The surplus votes that would have gone to the winner go to the next preference. This can be done in several ways (see § Counting methods). If no-one new meets the quota, the candidate with the fewest votes is eliminated and those votes are transferred to each voter's next preferred candidate. There are variations, such as how to transfer surplus votes from winning candidates and whether to transfer votes to already-elected candidates. When the number of votes transferred from the losing candidate with the fewest votes is too small to change the ordering of remaining candidates, more than one candidate can be eliminated simultaneously. however, this can produce fractional votes. See § Counting methods for a discussion of how this is handled. If a candidate is eliminated and their votes are transferred to already victorious candidates, then the new excess votes for the victorious candidate (transferred from the eliminated candidate) will be transferred to the next preference of the victorious candidate, as happened with their initial excess. However, any votes which would transfer from the victorious candidate to one who was already eliminated must be reallocated. See § Counting methods for details. Because votes cast for losing candidates and excess votes cast for winning candidates are transferred to voters' next choice candidates, STV is said to minimize wasted votes. Suppose a food election is conducted to determine what three foods to serve at a party. There are 5 candidates, 3 of which will be chosen. The candidates are: Oranges, Pears, Chocolate, Strawberries, and Sweets. The 20 guests at the party mark their ballots according to the table below. In this example, a second choice is made by only some of the voters. x x x x x x Chocolate is declared elected, since Chocolate has more votes than the quota (with six surplus votes, to be precise). In this case, 8 of the 12 voters for Chocolate had the second preference of Strawberries, so (8/12)•6 = 4 of Chocolate's votes would transfer to Strawberries; meanwhile 4 of the 12 voters for Chocolate had Sweets as their second preference, so (4/12)•6 = 2 of Chocolate's votes will transfer to Sweets. Thus, Strawberries has 1 first-preference votes and 4 new votes, for an updated total of 1+4 = 5 votes; likewise, Sweets now has 1 + 2 = 3 votes; no other tallies change. Even with the transfer of this surplus no candidate has reached the quota. Therefore, Pear, which now has the fewest votes (after the update), is eliminated. x x x x Pear's votes are transferred in proportion to the second-preference options of voters of Pear, i.e. only Oranges in this case, which gives Oranges 2 more votes. Oranges now totals 4 (original) + 2 (new) = 6 votes, reaching the quota; so, Oranges is elected. Orange meets the quota exactly, and therefore has no surplus to transfer. x x x x Neither of the remaining candidates meets the quota, so again the lowest candidate (in this case Sweets) is eliminated. This leaves Strawberries as the only remaining candidate, so it wins the final seat (despite not satisfying the quota). Result: The winners are Chocolate, Oranges and Strawberries. This result differs from the one that would have occurred if the three winners were decided by first preference plurality rankings, in which case Pear would have been a winner as opposed to Strawberry for having a greater number of first preference votes. STV systems primarily differ in how they transfer votes and in the size of the quota. For this reason some have suggested that STV can be considered a family of voting systems rather than a single system. The Droop quota is the most commonly used quota. This ensures majority rule (except in rare cases) while maintaining the condition that no more candidates can reach a quota than there are seats to be filled. The Hare quota, which was used in the original proposals by Thomas Hare, ensures greater proportionality, at the expense of having to count more votes and not guaranteeing majority rule. The easiest methods of transferring surpluses involve an element of randomness; partially random systems, such as the Hare system, are used in the Republic of Ireland (except Senate elections) and in Malta, among other places. The Gregory method (also known as Newland-Britain or Senatorial rules) eliminates randomness by allowing for the transfer of fractions of votes. Gregory is in use in Northern Ireland, the Republic of Ireland (Senate elections) and in Australia. Both Gregory and earlier methods have the problem that in some circumstances they do not treat all votes equally. For this reason Meek's method, Warren's method and the Wright system have been invented. While easier methods can usually be counted by hand, except in a very small election Meek and Warren require counting to be conducted by computer. The Wright system is a refinement of the Australian Senate system replacing the process of distribution and segmentation of preferences by a reiterative counting process where the count is reset and restarted on every exclusion. Meek is used in local body elections in New Zealand. Meek in 1969 was the first to realize that computers make it possible to count votes in way that is conceptually simpler and closer to the original concept of STV. One advantage of Meek's method is that the quota is adjusted at each stage of counting when the number of votes decreases because some become non-transferable. Meek also considered a variant on his system which allows for equal preferences to be expressed. This has subsequently (since 1998) been used by the John Muir Trust for electing its trustees. The concept of transferable voting was first proposed by Thomas Wright Hill in 1819. 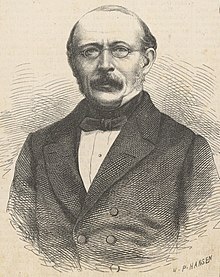 The system remained unused in public elections until 1855, when Carl Andræ proposed a transferable vote system for elections in Denmark, and his system was used in 1856 to elect the Rigsraad and from 1866 it was also adapted for indirect elections to the second chamber, the Landsting, until 1915. Although he was not the first to propose transferable votes, the English barrister Thomas Hare is generally credited with the conception of STV, and he may have independently developed the idea in 1857. Hare's view was that STV should be a means of "making the exercise of the suffrage a step in the elevation of the individual character, whether it be found in the majority or the minority." In Hare's original system, he further proposed that electors should have the opportunity of discovering which candidate their vote had ultimately counted for, to improve their personal connection with voting. At the time of Hare's original proposal, the UK did not use the secret ballot, so not only could the voter determine the ultimate role of their vote in the election, the elected MPs would have been able to determine who had voted for them. As Hare envisaged that the whole House of Commons be elected "at large" this would have replaced geographical constituencies with what Hare called "constituencies of interest" – those people who had actually voted for each MP. In modern elections, held by secret ballot, a voter can discover how their vote was distributed by viewing detailed election results. This is particularly easy to do using Meek's method, where only the final weightings of each candidate need to be published. The elected member is, however, unable to verify who their supporters are. The noted political essayist John Stuart Mill was a friend of Hare's and an early proponent of STV, praising it at length in his essay Considerations on Representative Government, in which he writes: "Of all modes in which a national representation can possibly be constituted, this one affords the best security for the intellectual qualifications desirable in the representatives. At present... the only persons who can get elected are those who possess local influence, or make their way by lavish expenditure...." His contemporary, Walter Bagehot, also praised the Hare system for allowing everyone to elect an MP, even ideological minorities, but also argued that the Hare system would create more problems than it solved: "[the Hare system] is inconsistent with the extrinsic independence as well as the inherent moderation of a Parliament – two of the conditions we have seen, are essential to the bare possibility of parliamentary government." Advocacy of STV spread through the British Empire, leading it to be sometimes known as British Proportional Representation. In 1896, Andrew Inglis Clark was successful in persuading the Tasmanian House of Assembly to be the first parliament in the world elected by what became known as the Hare-Clark electoral system, named after himself and Thomas Hare. H. G. Wells was a strong advocate, calling it "Proportional Representation". The HG Wells formula for scientific voting, repeated, over many years, in his PR writings, to avoid misunderstanding, is Proportional Representation by the Single Transferable Vote in large constituencies. STV in large constituencies permits an approach to the Hare-Mill-Wells ideal of mirror representation. The UK National Health Service used to elect, First Past The Post, all white male General Practitioners. In 1979, STV proportionally represented women, immigrants and specialists, to the General Medical Council. In 1948, single transferable vote proportional representation on a state-by-state basis became the method for electing Senators to the Australian Senate. This change has led to the rise of a number of minor parties such as the Democratic Labor Party, Australian Democrats and Australian Greens who have taken advantage of this system to achieve parliamentary representation and the balance of power. From the 1984 election, group ticket voting was introduced in order to reduce a high rate of informal voting but in 2016, group tickets were abolished to avoid undue influence of preference deals amongst parties that were seen as distorting election results and a form of optional preferential voting was introduced. In the United States, the Proportional Representation League was founded in 1893 to promote STV, and their efforts resulted in its adoption by many city councils in the first half of the 20th century. More than twenty cities have used STV, including Cleveland, Cincinnati and New York City. As of January 2010, it is used to elect the city council and school committee in Cambridge, Massachusetts and the park board in Minneapolis, Minnesota. STV has also been adopted for student government elections at more than fifty American universities, including Caltech, Carnegie Mellon, Harvard, MIT, Michigan, Oberlin, Reed, Rice, Stanford, Tufts, UC Berkeley, UC Davis, UCLA, UC San Diego, UC Santa Barbara, Vassar, Whitman, UNC, UVA, and UT Austin. Legislation (HR 3057), was introduced in Congress in June 2017 that would establish STV for US House elections starting in 2022. The degree of proportionality of STV election results depends directly on the district magnitude (i.e. the number of seats in each district). While Ireland originally had a median district magnitude of five (ranging from three to nine) in 1923, successive governments lowered this. Systematically lowering the number of representatives from a given district directly benefits larger parties at the expense of smaller ones. Supposing that the Droop quota is used: in a nine-seat district, the quota or threshold is 10% (plus one vote); in a three-seat district, it would be 25% (plus one vote). A parliamentary committee in 2010 discussed the "increasing trend towards the creation of three-seat constituencies in Ireland" and recommended not less than four-seaters, except where the geographic size of such a constituency would be disproportionately large. STV provides proportionality by transferring votes to minimize waste, and therefore also minimizes the number of unrepresented or disenfranchised voters. A frequent concern about STV is its complexity compared with plurality voting methods. Before the advent of computers, this complexity made ballot-counting more difficult than for some other voting methods. STV differs from other proportional representation systems in that candidates of one party can be elected on transfers from voters for other parties. Hence, STV may reduce the role of political parties in the electoral process and corresponding partisanship in the resulting government. A district only needs to have four members to be proportional for the major parties,[where?] but may under-represent smaller parties, even though they may well be more likely to be elected under STV than under first past the post. Also, while small parties seen as reasonable second preferences by others (such as the Green Party in Ireland) more easily get elected, parties seen as more extreme by others (such as Sinn Féin in Ireland) find it harder to attract second preferences and therefore find it harder to win seats. The countback method is used in the Australian Capital Territory, Tasmania, Victoria, Malta, and Cambridge, Massachusetts. Casual vacancies can be filled by re-examining the ballot papers data from the previous election. Another option is to have a head official or remaining members of the elected body appoint a new member to fulfill the vacancy. A third way to fill a vacancy is to hold a single-winner by-election (effectively instant runoff); this allows each party to choose a new candidate and all voters to participate. This is the method used in the Republic of Ireland and in Scotland's local elections. Yet another option is to allow the party of the vacant member to nominate a successor, possibly subject to the approval of the voting population or the rest of the government. Another possibility is to have the candidates themselves create an ordered list of successors before leaving their seats. In the European Parliament, a departing member from the Republic of Ireland or Northern Ireland is replaced with the top eligible name from a replacement list submitted by the candidate at the time of the original election. This method was also used in the Northern Ireland Assembly, until 2009, when the practice was changed to allow political parties to nominate new MLAs in the event of vacancies. Independent MLAs may still draw up lists of potential replacements. For its 2009 European elections, Malta introduced a one-off policy to elect the candidate eliminated last to fill the prospective vacancy for the extra seat that arose from the Lisbon Treaty. If there are not enough candidates to represent one of the priorities the electorate vote for (such as a party), all of them may be elected in the early stages, with votes being transferred to candidates with other views. On the other hand, putting up too many candidates might result in first preference votes being spread too thinly among them, and consequently several potential winners with broad second-preference appeal may be eliminated before others are elected and their second-preference votes distributed. In practice, the majority of voters express preference for candidates from the same party in order, which minimizes the impact of this potential effect of STV. The outcome of voting under STV is proportional within a single election to the collective preference of voters, assuming voters have ranked their real preferences and vote along strict party lines (assuming parties and no individual independents participate in the election). However, due to other voting mechanisms usually used in conjunction with STV, such as a district or constituency system, an election using STV may not guarantee proportionality across all districts put together. 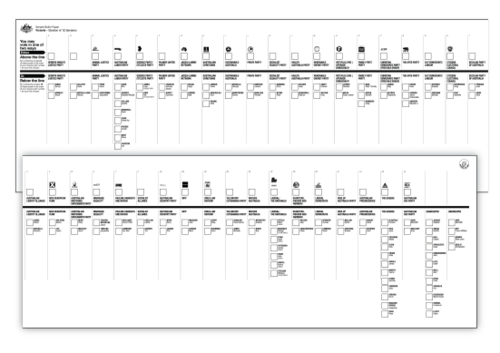 STV systems vary, both in ballot design and in whether or not voters are obliged to provide a full list of preferences. In jurisdictions such as Malta, Republic of Ireland and Northern Ireland, voters may rank as many or as few candidates as they wish. Consequently, voters sometimes, for example, rank only the candidates of a single party, or of their most preferred parties. A minority of voters, especially if they do not fully understand the system, may even "bullet vote", only expressing a first preference, or indicate a first preference for multiple candidates, especially when both STV and plurality are being used in concurrent elections. Allowing voters to rank only as many candidates as they wish grants them greater freedom, but can also lead to some voters ranking so few candidates that their vote eventually becomes "exhausted"–that is, at a certain point during the count, it can no longer be transferred and therefore loses an opportunity to influence the result. Some opponents[who?] argue that larger, multi-seat districts would require more campaign funds to reach the voters. Proponents argue that STV can lower campaign costs because like-minded candidates can share some expenses. Proponents reason that negative advertising is disincentivized in such a system, as its effect is diluted among a larger pool of candidates. In addition, unlike in at-large plurality elections, candidates do not have to secure the support of at least 50% of voters, allowing candidates to focus campaign spending primarily on supportive voters. Academic analysis of voting systems such as STV generally centers on the voting system criteria that they pass. No preference voting system satisfies all the criteria in Arrow's impossibility theorem: in particular, STV fails to achieve independence of irrelevant alternatives (like most other vote-based ordering systems) and monotonicity. The data can also be analysed to find the proportion of voters who express only a single preference, or those who express a minimum number of preferences, in order to assess party strength. Where parties nominate multiple candidates in an electoral district, analysis can also be done to assess their relative strength. ^ STV was previously used for the Dublin University constituency in the 1918 general election. ^ STV was previously used for the 1919 special election for Sligo Corporation. ^ "Single Transferable Vote". Electoral Reform Society. ^ "Proportional Representation and its Importance". Proportional Representation Society of Australia. ^ "Our mission". Electoral Reform Society. Archived from the original on 12 February 2013. ^ "Fair Representation Voting". FairVote. ^ "Ranked Choice Voting". FairVote. ^ Margetts 2003, p. 68. ^ "Single Transferable Vote". Department of Internal Affairs. 2013. Retrieved 1 April 2016. ^ "What offices are elected using Ranked-Choice Voting?". What is Ranked-Choice Voting?. City of Minneapolis Elections & Voter Services. Retrieved 31 December 2017. ^ http://www.fairvote.org/how_rcv_works Note that when used to elect a multiple candidates to office, ranked choice voting (RCV or IRV) is a form of fair representation voting, and it may be called single transferable vote or STV. ^ "Newsletter of Proportional Representation Society of Australia QUOTA NOTES September 1986 QN43". www.prsa.org.au. ^ a b Lambert & Lakeman 1955, p. 245. ^ Hill, Wichmann & Woodall 1987. ^ "Examples of STV elections". hw.ac.uk. ^ "Andræs metode | Gyldendal - Den Store Danske". denstoredanske.dk. ^ Mill 1861, p. 144. ^ Wells 1918, pp. 121–129. ^ HG Wells 1916: The Elements of Reconstruction. HG Wells 1918: In The Fourth Year. ^ Electoral Reform Society, 1979 audit, which records the gratitude of the British medical profession for introducing STV. ^ Anderson, Stephanie (25 April 2016). "Senate Voting Changes Explained in Australian Electoral Commission Advertisements". ABC News. Retrieved 30 August 2017. ^ "RCV in Campus Elections". FairVote. ^ Donald, Beyer (14 July 2017). "H.R.3057 – 115th Congress (2017–2018): Fair Representation Act". www.congress.gov. ^ Ireland 2010, p. 177. ^ "Change to the System for Filling Vacancies in the NI Assembly" (Press release). Northern Ireland Office. 10 February 2009. Archived from the original on 7 March 2012. Retrieved 5 October 2011. ^ Curtice 2012, p. 13. ^ a b Curtice 2012, p. 14. ^ Curtice 2012, pp. 17–18. ^ Curtice 2012, pp. 15–16. ^ Curtice 2012, p. 23. Bagehot, Walter (1894) . The English Constitution (7th ed.). London: Kegan Paul, Trench, Trübner & Co. – via Wikisource. Curtice, John (2012). "2012 Scottish Local Government Elections" (PDF). London: Electoral Reform Society. Archived from the original (PDF) on 15 September 2015. Retrieved 30 August 2017. Hill, I. D.; Wichmann, B. A.; Woodall, D. R. (1987). "Algorithm 123: Single Transferable Vote by Meek's Method". The Computer Journal. 30 (3): 277–281. doi:10.1093/comjnl/30.3.277. ISSN 1460-2067. Ireland. Oireachtas. Joint Committee on the Constitution (2010). Article 16 of the Constitution: Review of the Electoral System for the Election of Members to Dáil Éireann (PDF). Dublin: Stationery Office. ISBN 978-1-4064-2501-7. Archived from the original (PDF) on 18 January 2012. Retrieved 20 November 2010. Lambert, Enid; Lakeman, James D. (1955). Voting in Democracies. London: Faber and Faber. Margetts, Helen (2003). "Electoral Reform". In Fisher, Justin; Denver, David; Benyon, John (eds.). Central Debates in British Politics. Abingdon, England: Routledge (published 2014). pp. 64–82. ISBN 978-0-582-43727-2. Meek, B. L. (1994a). "A New Approach to the Single Transferable Vote. Paper I: Equality of Treatment of Voters and a Feedback Mechanism for Vote Counting". Voting Matters (1): 1–7. ISSN 1745-6231. Retrieved 30 August 2017. ——— (1994b). "A New Approach to the Single Transferable Vote. Paper II: The Problem of Non-transferable Votes". Voting Matters (1): 7–11. ISSN 1745-6231. Retrieved 30 August 2017. Mill, John Stuart (1861). Considerations on Representative Government. London: Parker, Son, and Bourn. Retrieved 20 June 2014 – via Google Books. Newland, Robert A. (1984). "The STV Quota". Representation: Journal of the Electoral Reform Society. 24 (95): 14–17. doi:10.1080/00344898408459347. ISSN 0034-4893. Ombler, Franz (2006). "Booklet Position Effects, and Two New statistics to Gauge Voter Understanding of the Need to Rank Candidates in Preferential Elections" (PDF). Voting Matters (21): 12–21. ISSN 1745-6231. Retrieved 30 August 2017. Wells, H. G. (1918). In the Fourth Year: Anticipation of a World Peace. London: Chatto & Windus. Retrieved 6 May 2016 – via Internet Archive. Bartholdi, John J., III; Orlin, James B. (1991). "Single Transferable Vote Resists Strategic Voting" (PDF). Social Choice and Welfare. 8 (4): 341–354. CiteSeerX 10.1.1.127.97. doi:10.1007/BF00183045. ISSN 0176-1714. JSTOR 41105995. Retrieved 30 August 2017. Geller, Chris (2002). "Single Transferable Vote with Borda Elimination: A New Vote-Counting System" (PDF). Deakin University, Faculty of Business and Law. ——— (2004). "Single Transferable Vote with Borda Elimination: Proportional Representation, Moderation, Quasi-chaos and Stability". Electoral Studies. 24 (2): 265–280. doi:10.1016/j.electstud.2004.06.004. ISSN 1873-6890. O'Neill, Jeffrey C. (2004). "Tie-Breaking with the Single Transferable Vote" (PDF). Voting Matters (18): 14–17. ISSN 1745-6231. Retrieved 30 August 2017. Sawer, Marian & Miskin, Sarah (1999). Papers on Parliament No. 34 Representation and Institutional Change: 50 Years of Proportional Representation in the Senate. Department of the Senate. ISBN 978-0-642-71061-1. Accurate Democracy lists a dozen programs for computing the single transferable vote.